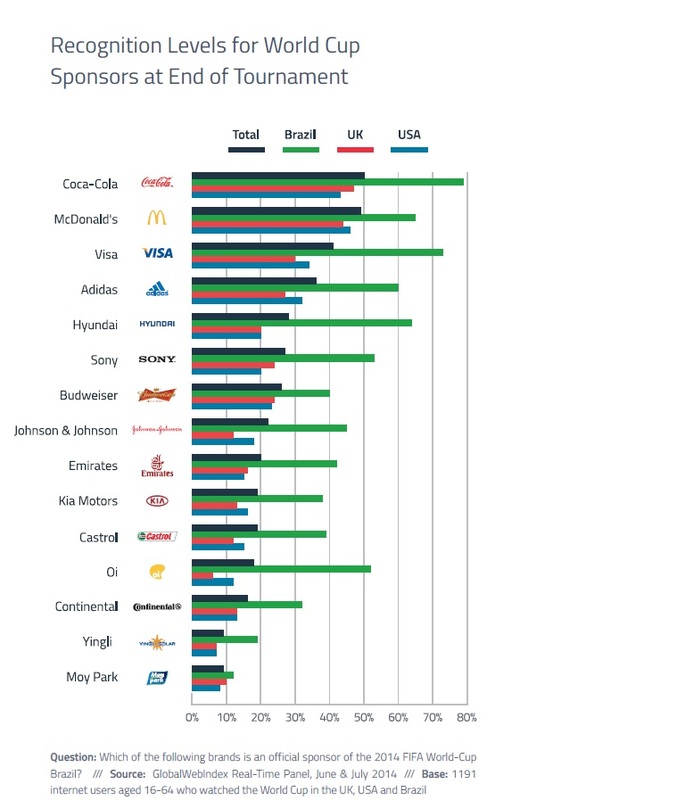 Coca-Cola, McDonald's, Visa and Adidas were the most recognised sponsors of the World Cup in Brazil, achieving recognition among 50%, 39%, 41% and 36% of UK, US and Brazilian consumers respectively, according to research from GlobalWebIndex. 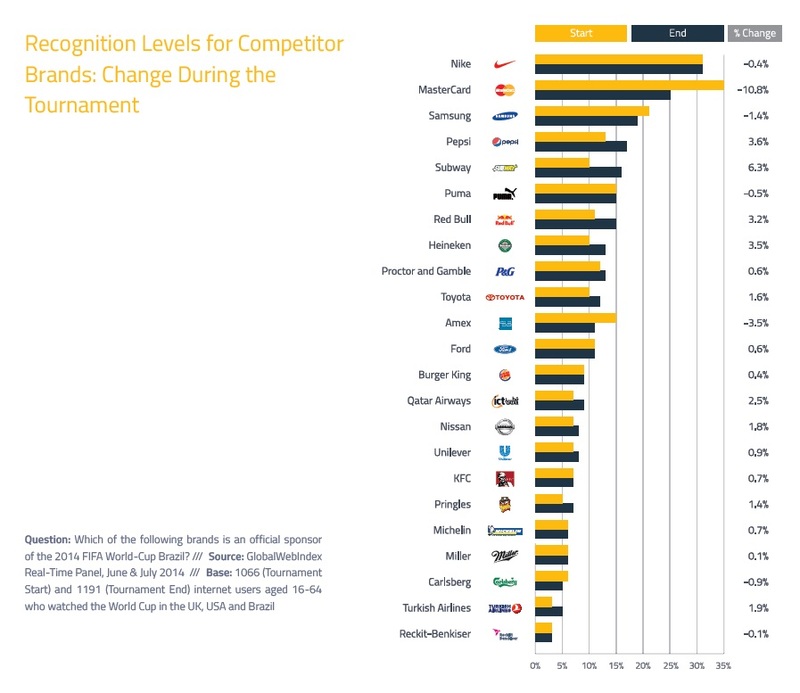 However, 30% of those surveyed still thought non-sponsor Nike was officially associated with the event, with similar levels of misplaced recognition for MasterCard (25%) and Samsung (20%). 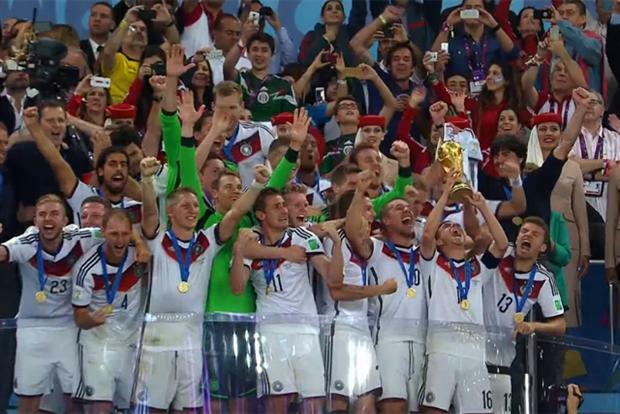 The credit card brand, which has not sponsored the World Cup since 2006, did however experience something of a fall in awareness over the course of the event, after garnering a recognition score of 38% at the start of the tournament. But the research found that no official partner brand had increased its recognition by more than 5% by the end of the tournament. McDonald’s was the highest climber, with an increase of 5.3%. Of the official partners’ rivals, Subway achieved the biggest boost to awareness levels, up 6%. GlobalWebIndex surveyed people who watched the competition in the UK, US and Brazil. The research found that sponsor awareness was much higher in the host nation than the other two markets. The research project involved the firm asking members of its real-time panels in the UK, US and Brazil to identify sponsors. 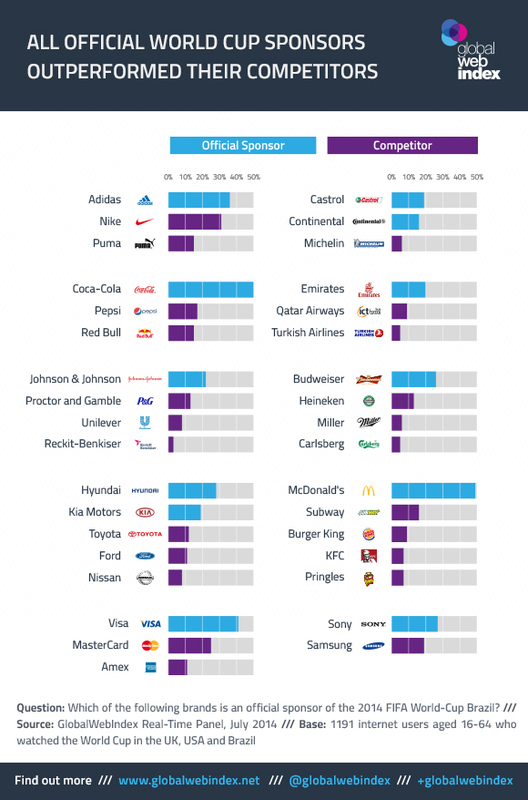 Respondents were asked to pick official World Cup sponsors from a list of 38 brands, both official sponsors and their non-sponsor rivals. A full copy of the report can be downloaded for free via GlobalWebIndex's website.